Some people go on holiday to 'get away from it all' – for others, seclusion is a way of life. 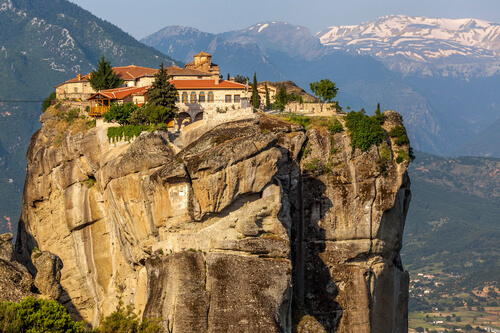 The Meteora Monasteries are located at the top of a stunning, elevated rock formation in the region of Thessaly in central Greece, 3km northwest of the town of Kalabaka. Meteora is also accessible from Athens by train, by bus and by car. Inspired by the climbing skills of local hermits, settler monks began building monasteries on its precarious, isolated rocks in the 14th century. Two hundred years later, there were 24 monasteries in Meteora, of which six now survive. Approximately 60 monks and nuns still live in the iconic structures, which stand out against the skyline with their bright red roofs, positioned high on eye-catching sandstone peaks. Open to the public, the monasteries are both a living piece of history and a time capsule that enables visitors to learn more about Greek Orthodox Christians. Religious services are still carried out, with several open to all faiths and visitors. It costs €3 (AU$5) to enter each monastery and the dress code requires both men and women to cover their legs and their shoulders. The opening times of each monastery vary slightly, but the majority open in the morning from 9am until lunchtime, making this a good time to visit. If you would like to visit a particular site, it’s advisable to check ahead of time because they each have different days on which they are closed. The Monastery of Great Meteoron is the largest of the six still standing, filled with artefacts that date back to its 14th-century inception and decorated with fresco watercolours that cover its walls and ceilings. The other monasteries are no less photogenic: the Monastery of the Holy Trinity previously graced the silver screen in the classic 1981 James Bond movie, For Your Eyes Only. The Monastery of Varlaam is one of several monasteries that have a museum, in which visitors can learn more about the monks’ and nuns’ way of life throughout the ages. Navigating the monasteries can be tiring but rewarding work. Luckily you no longer have to rely on the system of ropes, pulleys and baskets that the monks used to transport food during times of war and sieges. Down from the peaks of the rock formation, visitors are well catered for with a range of culinary options – from the occasional ice cream truck outside the Monastery of Varlaam to a variety of nearby eateries. Taverns serving hearty salads and rustic hot dishes rule the roost, with Elia’s Garden proving popular with celebrities and even royalty, while the Meteoron Panorama Restaurant offers up the stunning views that its name suggests. 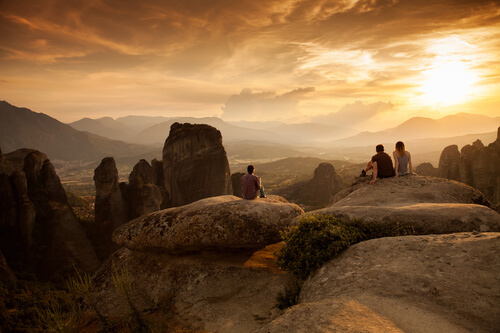 For anyone looking for further adventure, Meteora preserves nature alongside its monasteries. The area’s rare species of birds and flowers resulted in it being named a Natura 2000 Ecological Zone and half-day walking tours are available from €30 (AU$47) for adults.